Photography, or the process of recording an image through the manipulation of light on a light-sensitive material, has undergone a significant evolution since the invention of the first complete photographic process in the 1820s by Nicéphore Niépce. Building on Niépce’s work, Louis Jacques Mandé Daguerre created the first photographic process available to the public in 1839. Known as the daguerreotype, it consisted of a detailed image on a sheet of silver-plated copper, and was popular between 1842 and 1856. In order to create an image, the plate was coated in light-sensitive silver iodide, and then placed inside of a camera and exposed to light. After exposure, the plate was developed using heated mercury, which reacted to the iodide and formed an image through the combination of silver mercury. The image was then fixed through a solution of salt. 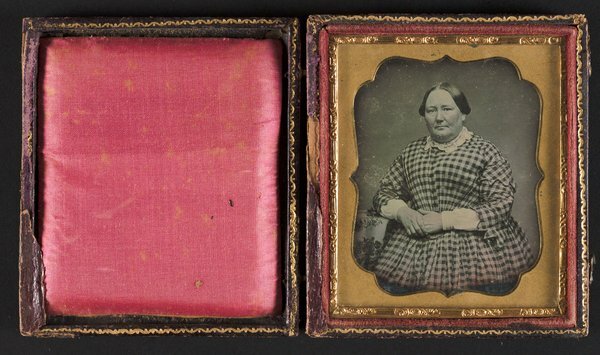 Daguerreotypes were particularly susceptible to damage such as tarnishing, and thus were usually placed behind glass and a metal mat inside of a small case. 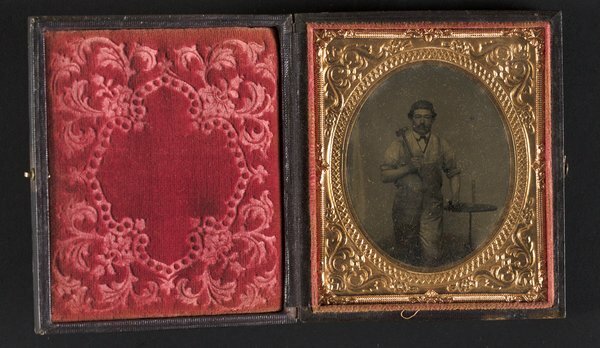 The next major photographic process was the ambrotype. First appearing in 1854, the ambrotype was popular from 1855 to 1861. They were made using a collodion process, which involved coating a piece of glass with a layer of iodized collodion, and immersing the glass in a solution of silver nitrate to form silver iodide. While still wet, the plate was exposed to light in the camera, and then developed and fixed immediately. 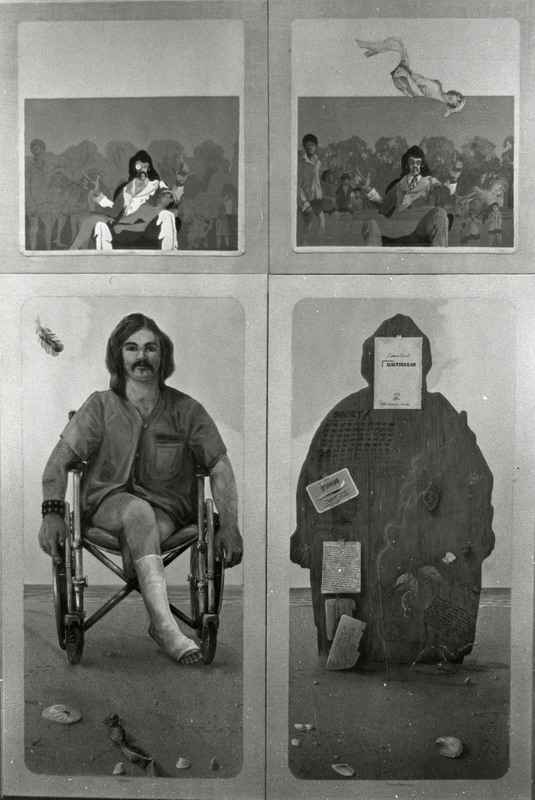 Ambrotypes consisted of an image on the front side of a single plate of glass, with the back of the glass covered with a piece of black paper or cloth, so that the negative appearing image looked positive. Like daguerreotypes, they were delicate and thus were placed in a case under a protective mat and glass. Derived from the ambrotype was the tintype, which was invented in 1856. The tintype was popular between 1860 and 1870, and it relied on the collodion process like the ambrotype. However, instead of glass, the image was produced on a thin sheet of iron covered by a lacquer or enamel coating. Tintypes were commonly used for portraiture, however they were the first photographic process to capture a wide array of subjects, because they were relatively easy to produce and were inexpensive. Tintypes were commonly displayed in paper envelopes or folding cards. The carte de visite was the next important development in photography. Appearing 1859, this type of photography was popular between 1860 and 1880, and had a significant impact on consumer photography. This process was particularly attractive to consumers because the materials were less expensive than in other photographic processes, and the image had a more natural appearance than the tintype due to its use of the albumen process of printing. It was also the first photographic process to use a glass negative, which meant that multiple copies of the image could be produced. As a result, people started collecting and sharing photographs on a large scale, and photograph albums started to become popular in the early 1860s. Carte de visite images were developed on a very thin sheet of paper, which was then affixed to a piece of card stock, and were all the same size. 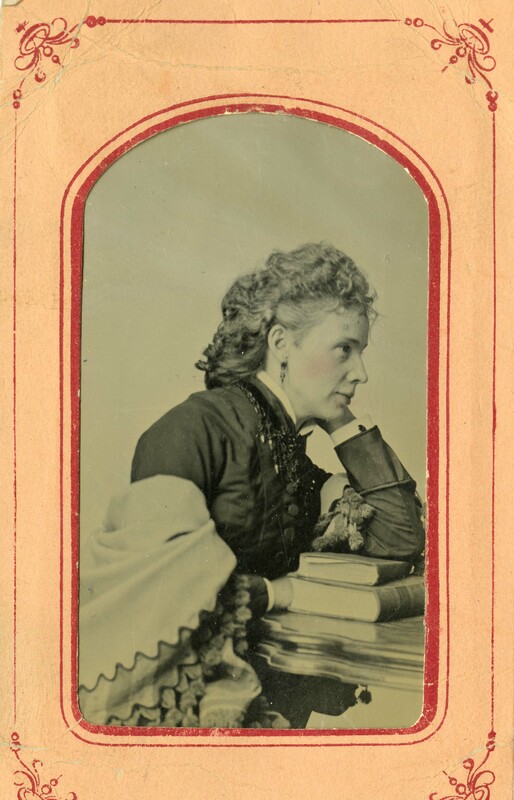 The cabinet card followed the carte de visite. First developed in 1866, this type of photography was popular between 1875 and 1900. 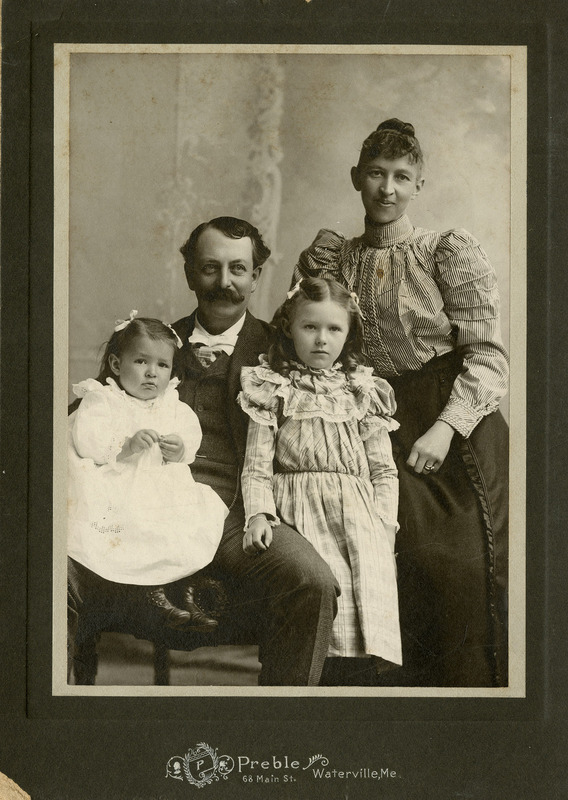 The cabinet card became known for its use as the best medium for the family portrait. It was developed using the same process as the carte de visite, however the image of the cabinet card was more than double the size of the carte de visite. Initially, the quality of the image was not that different from the carte de visite, however by the 1880s, advancements in camera technology and the introduction of new photographic papers led to significant improvements in image quality. American Brass Company Records: Founded in 1893 with the consolidation of several different companies, the American Brass Company grew to become one of the largest brass manufacturers in U.S. history. The collection includes records and items dating from around 1800 to 1978. An important part of the collection consists of photographs that detail aspects of the company’s long history. The types of nineteenth-century photographs included in this collection are daguerreotypes, ambrotypes, tintypes, and cabinet cards. 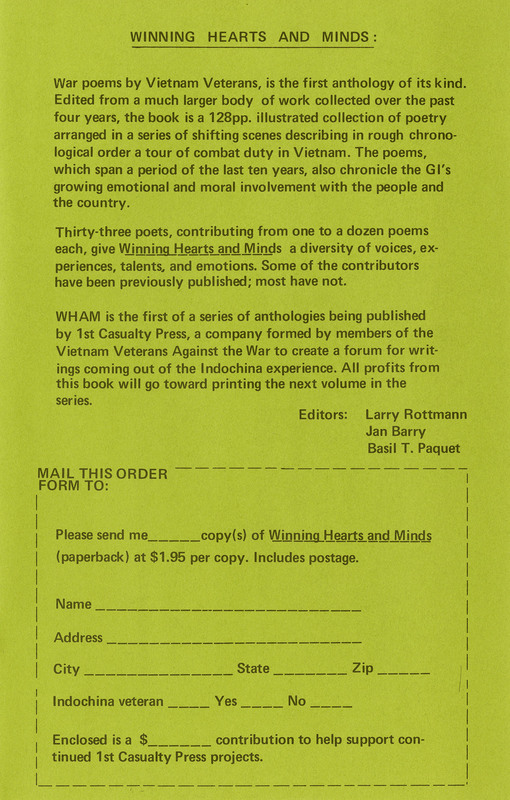 The finding aid is available at https://collections.ctdigitalarchive.org/islandora/object/20002%3A860129472. Margaret Waring Buck Papers: This collection consists of the personal papers and memorabilia of illustrator and naturalist Margaret Waring Buck (1905-1972). 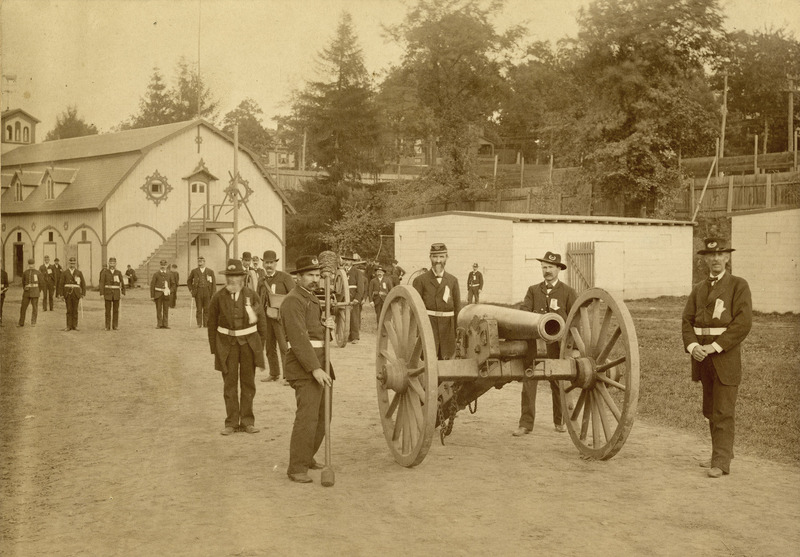 Besides original artwork and manuscripts, the collection contains many photographs from the nineteenth century. 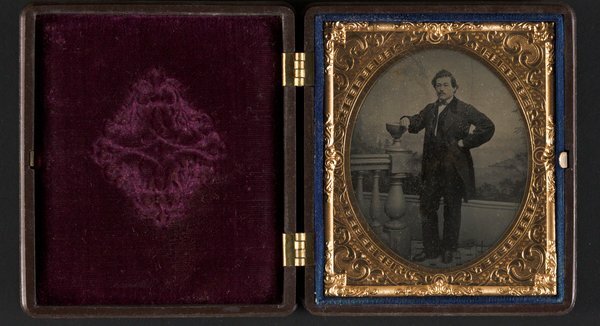 This collection includes examples of the daguerreotype, ambrotype, tintype, and carte de visite. 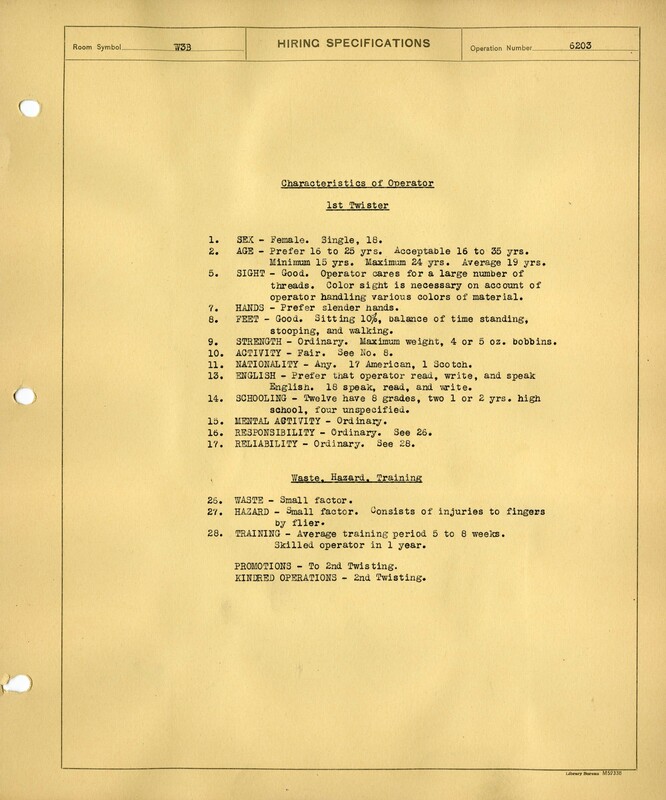 The finding aid is available at https://collections.ctdigitalarchive.org/islandora/object/20002%3A860138800. University Railroad Collection: This collection is made up of a wide variety of publications, reports, maps, artwork, and photography all associated with the history of the New York, New Haven & Hartford Railroad. Formed in 1872 when the New York & New Haven and Hartford & New Haven railroads merged, the company became the primary method of transportation in southern New England. Examples of daguerreotype and ambrotype photography can be found in this collection as part of the Ferdinand Leppens Papers. 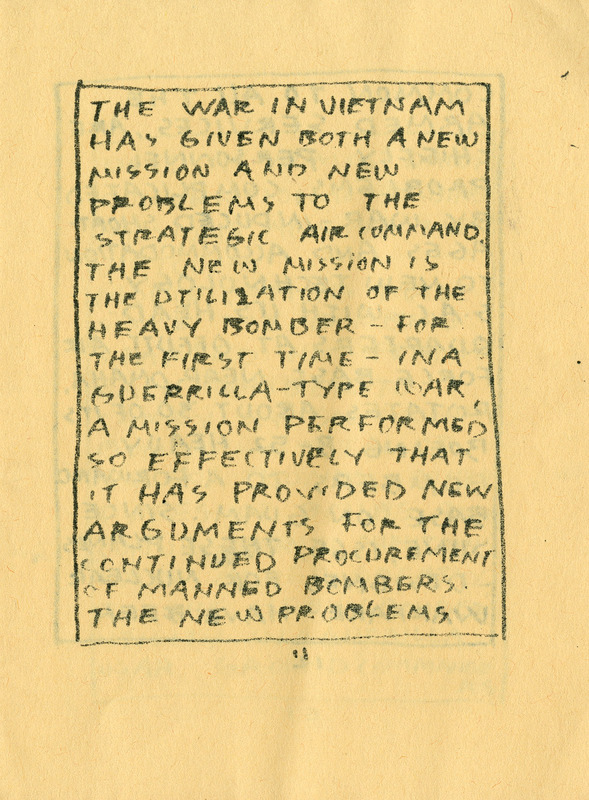 The finding aid is available at https://collections.ctdigitalarchive.org/islandora/object/20002%3A860140983. 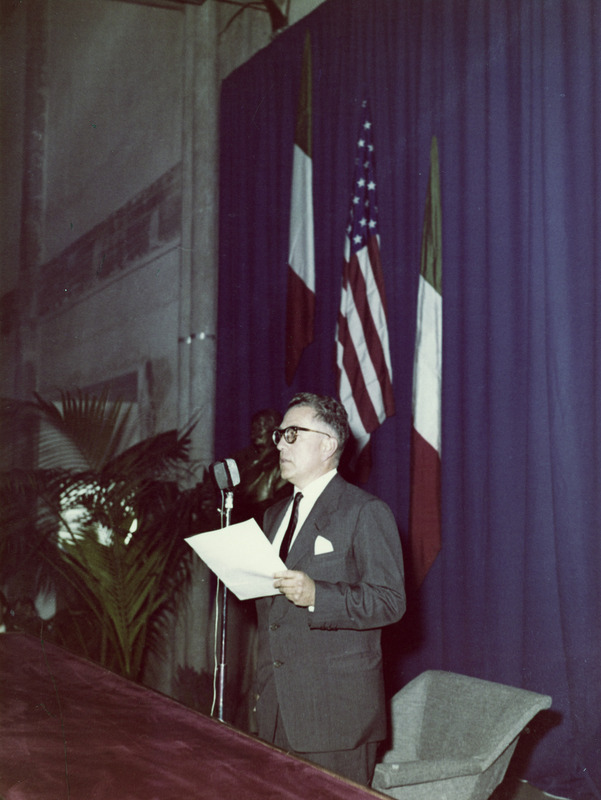 Oliver O. Jensen Papers: This collection consists of the personal and professional writings, records, manuscripts, and photographs of writer and editor Oliver O. Jensen (1914-2005). 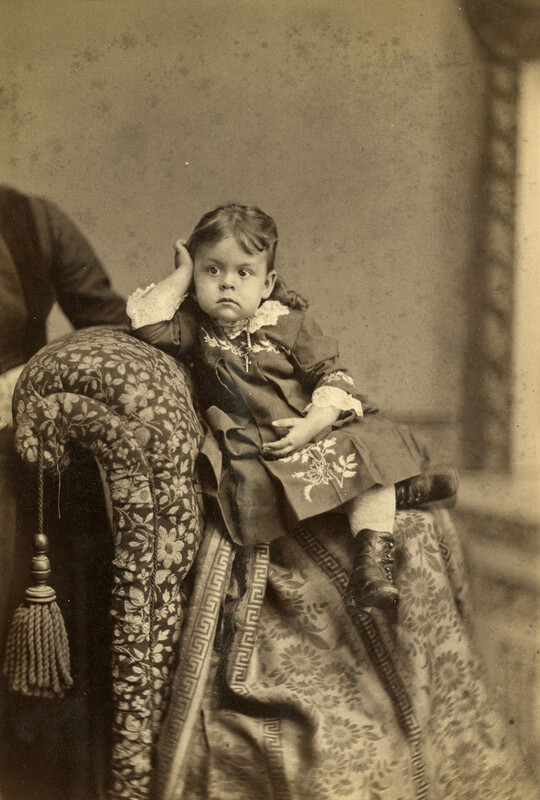 Examples of the tintype, carte de visite, and cabinet card can be found in this collection. 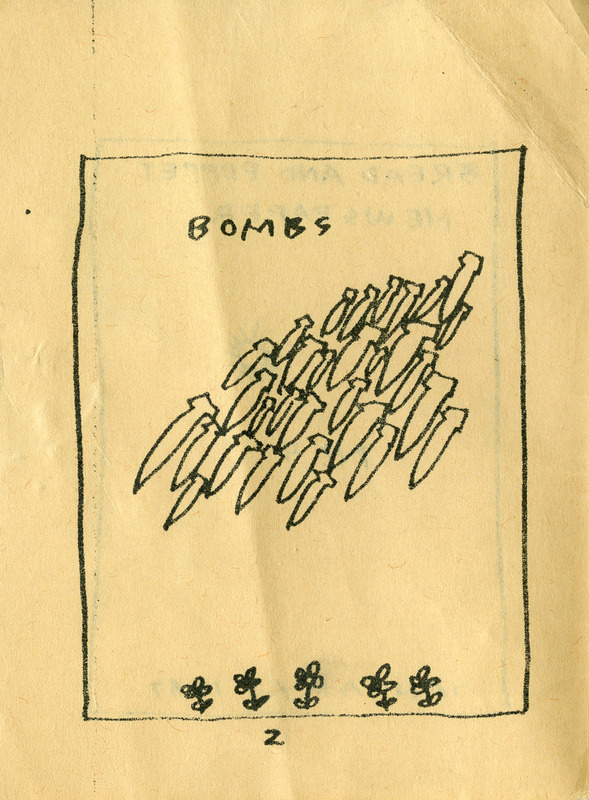 The finding aid is available at https://collections.ctdigitalarchive.org/islandora/object/20002%3A860118803. Ellen Emmet Rand Papers: This collection is made up of biographical materials of painter and illustrator Ellen Emmet Rand (1875-1941). It includes tintypes from Rand’s family history. 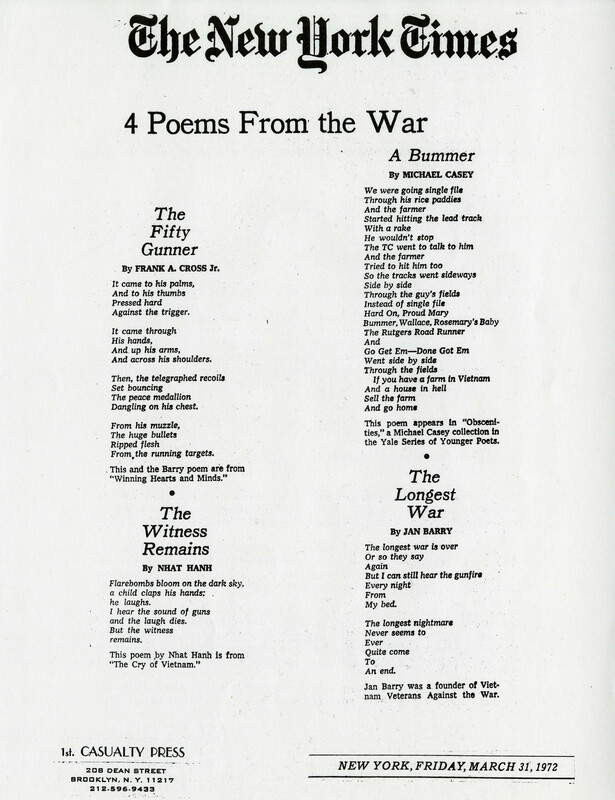 The finding aid is available at https://collections.ctdigitalarchive.org/islandora/object/20002%3A860257637. 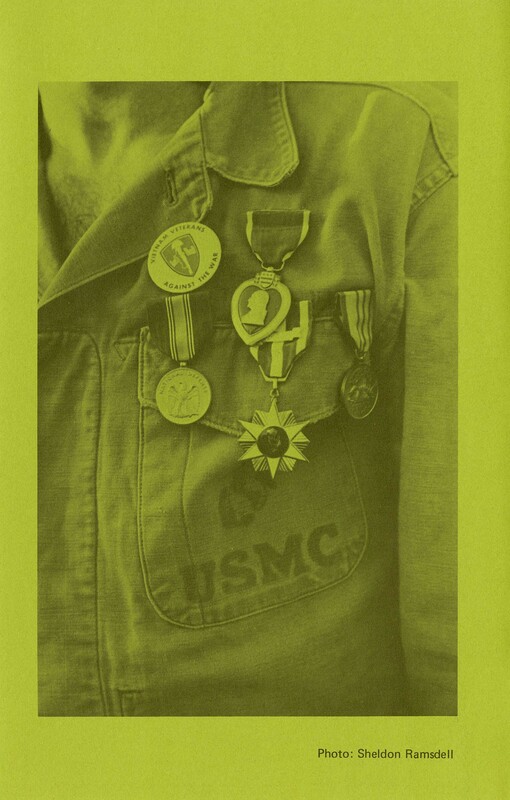 We invite you to view these collections in the reading room in Archives & Special Collections at the Thomas J. Dodd Research Center if you need resources on history of photography. Our staff is happy to assist you in accessing these and other collections in the archives. 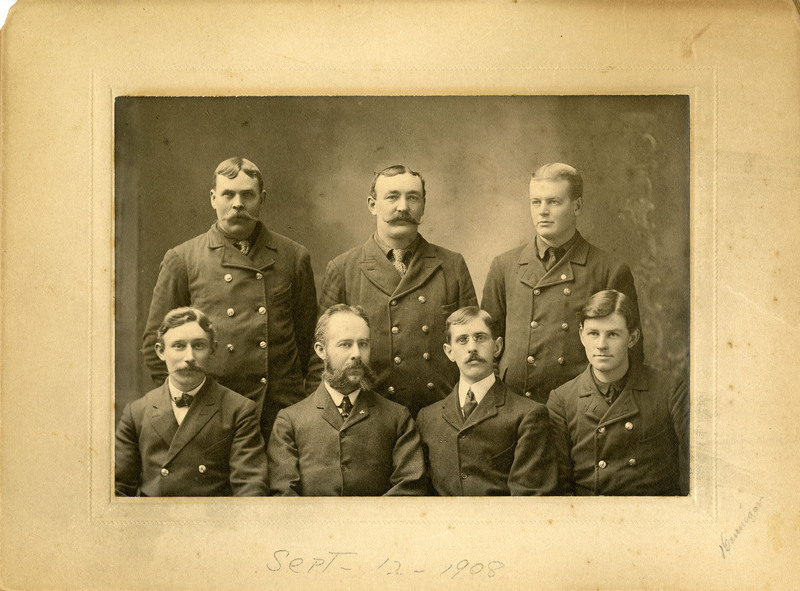 Linemen crew for the Southern New England Telephone Company, Middletown office, 1908 -- these men are identified! 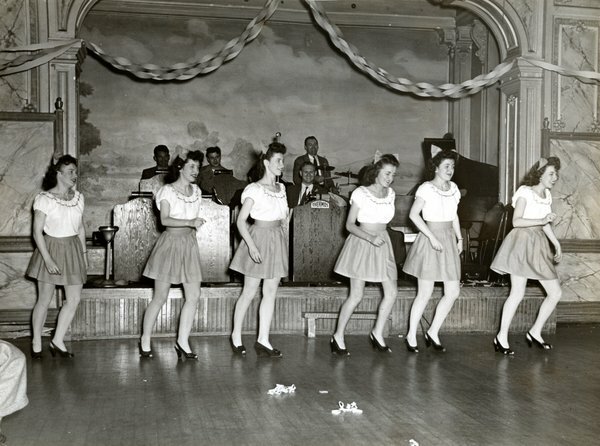 Unidentified workers of the Thermos Company performing in a variety show in the 1940s. Historians usually have no trouble finding information about famous people. After all, if someone was prominent and well known then there is often a record of him or her. A book may have been written, photographs taken, official documents deliberately saved, all because of that person’s fame, or notoriety. If someone was famous then finding enough information to put together the puzzle that was his or her life is relatively easy. But what about finding resources about someone who wasn’t famous? Someone who was decidedly UNfamous, just a regular person, a “common” man or woman? How do we find historical evidence that a certain obscure person existed? How do we create a narrative of that person’s life to the point that we know where he or she lived, worked, married, and parented on his or her journey through life? Archivists routinely help researchers find information about people who led lives that didn’t lead to fame. Often the questions come from genealogists, when people research their ancestors. This type of researcher often only has family lore, or stories passed from generation to generation, about their ancestors who may have lived perfectly normal lives but whose moments passed without much documentation to support these moments. Having worked with countless genealogists I can assure you that these searches are often the most frustrating, and heartbreaking, that we have to deal with. Frustrating because the information is so elusive; heartbreaking because of the researcher’s hopes for information. So what resources can we refer to in Archives & Special Collections that may provide something – anything – for the researcher of an obscure person? The good news is that there are many potential sources; the bad news is that all of them would require extensive research time and it is very likely to provide nothing verifiable for a researcher. But we’ve worked with enough genealogists to recognize that they are the hardiest of researchers, willing to slog through countless handwritten labor journals, hoping for that one nugget of information. 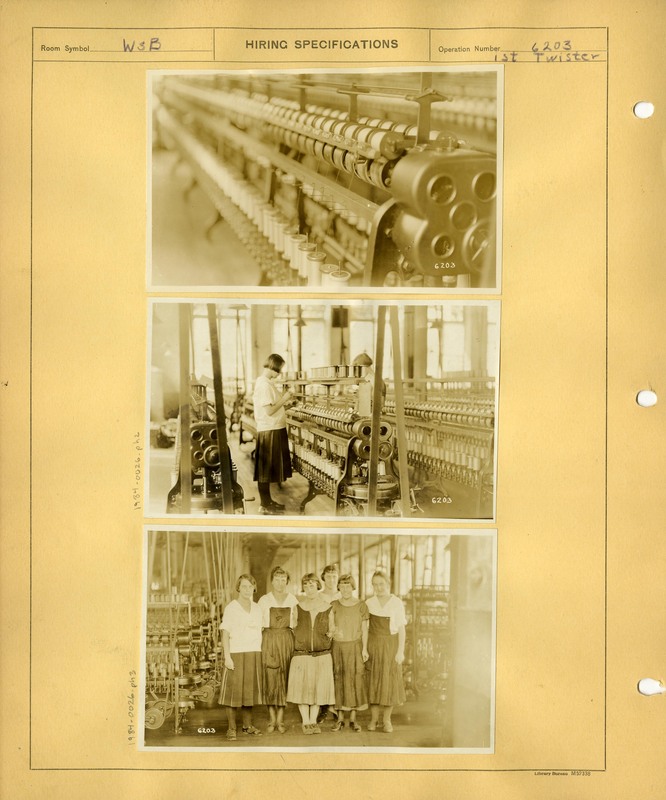 The Wauregan and Quinebaug Company, a textile mill in Wauregan, Connecticut, has an extensive set of labor records with a file for each worker who stopped working for the company from 1938 to 1957. 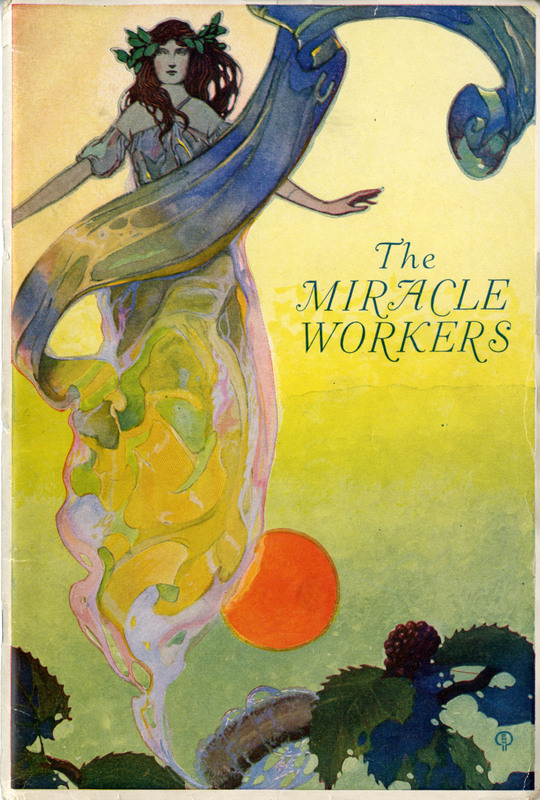 The listing of the workers can be found here: https://collections.ctdigitalarchive.org/islandora/object/20002%3A860134117. Please note that there are some restrictions on the use of these records. 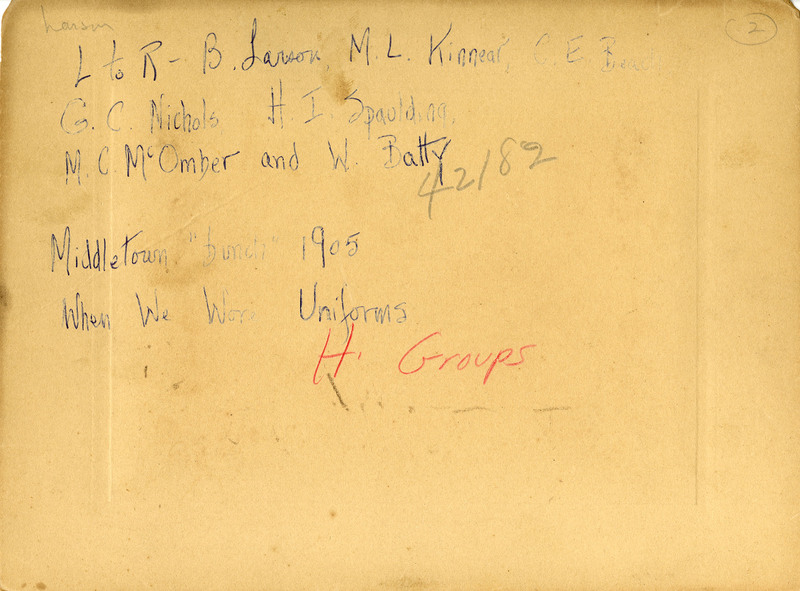 For some of our collections the only information that provides names of workers can be found in company newsletters. The collections where you can find these types of sources include the New Britain Machine Company Records (https://collections.ctdigitalarchive.org/islandora/object/20002%3A860115781), the Southern New England Telephone Company Records (https://collections.ctdigitalarchive.org/islandora/object/20002%3A860138740) and the Thermos Company, Taftville Plant, Records (https://collections.ctdigitalarchive.org/islandora/object/20002%3A860132926). One of our largest business company records are those of the New York, New Haven & Hartford Railroad (better known as the New Haven Railroad), and we get countless inquiries for information about those who worked for the railroad system, which encompassed all of southern New England from 1872 to 1969. At the peak of its business in the 1920s the New Haven Railroad employed over 30,000 people in the four states of New York, Connecticut, Rhode Island and Massachusetts. When the New Haven Railroad’s successor made the donation of the railroad’s records in the 1980s no personnel files came to UConn. But, there is one source to refer to, which are issues of “Along the Line,” the company’s employee newsletter, which began publication in the 1920s. 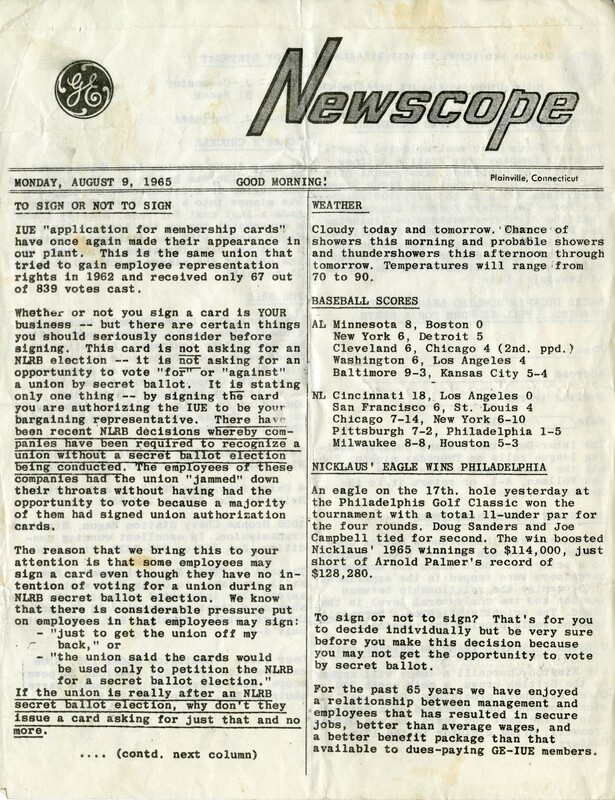 Although the newsletter stopped publication during the Great Depression it resumed in the early 1940s and continued, sporatically, into the early 1960s. While by no means a thorough source for information about every worker it is the only item we can provide that has the potential for information about those employed by the railroad. 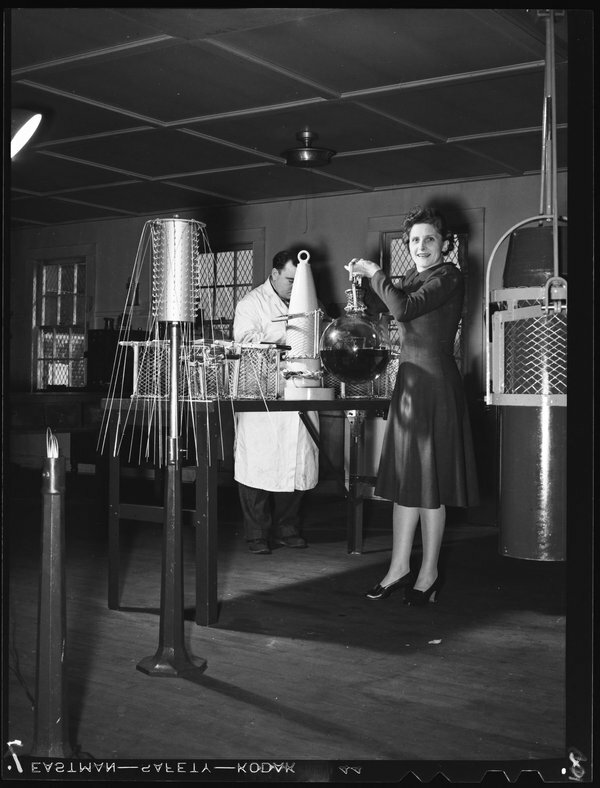 Many of the business collections have extensive sets of photographs, but a researcher will invariably find that an extremely small number of them will have any identification of the persons in the image. I would ballpark that of the tens of thousands of photographs of non-noteworthy persons that we have in the archives perhaps 1% of them will include the name of the person. This list is by no means complete simply because almost any archival resource from any of our collections has the potential to provide information about an obscure person. Check the digital repository (http://archives.lib.uconn.edu/) and inquire at our reference desk for sources about your personal favorite ordinary person and we’ll see what we can find. Vivien Kellems, President of Kellems Cable Grips, Inc.
Much of Connecticut’s standing as an industrial powerhouse in the 19th and early 20th centuries had its roots in small businesses of the early and mid-19th century. Often these businesses, founded by industrious people (usually men) and formed as family firms, provided resources needed at the time, such as grist mills or small-town merchants or craftsmen. As years passed they evolved to become prominent companies that provided goods for a developing nation. For example, the C.H. Dexter Company began in 1767 as a paper mill in Windsor Locks, Connecticut; two hundred years later the company had grown to be an international conglomerate of specially papers with factories in North America, Europe and Asia. These businesses were formed by businesspeople (usually men) who had strong visions for success. 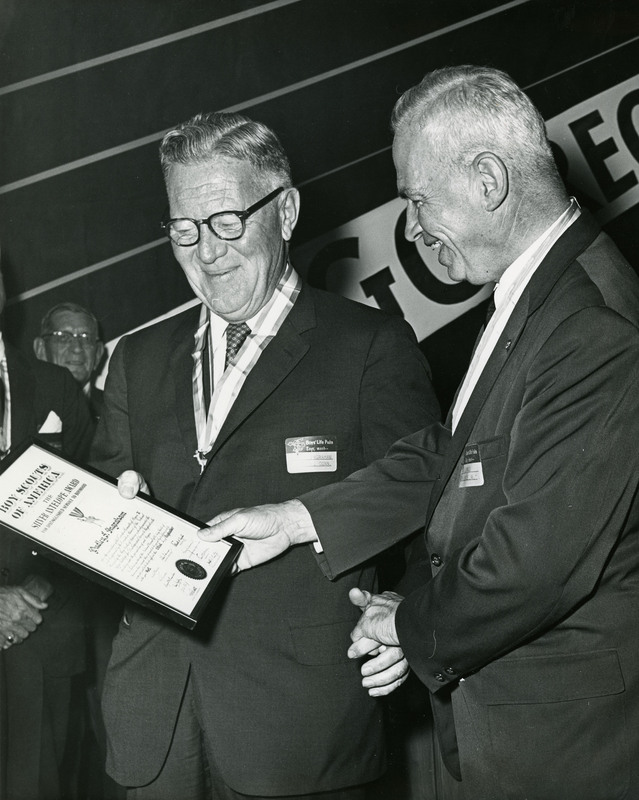 Often headed by descendants of the founders, these businesses took great pride in the company’s legacy and frequently harkened back to the founder’s vision and achievements. The Business History Collections in Archives & Special Collections holds the records of many prominent companies that were formed by visionary people (usually men). 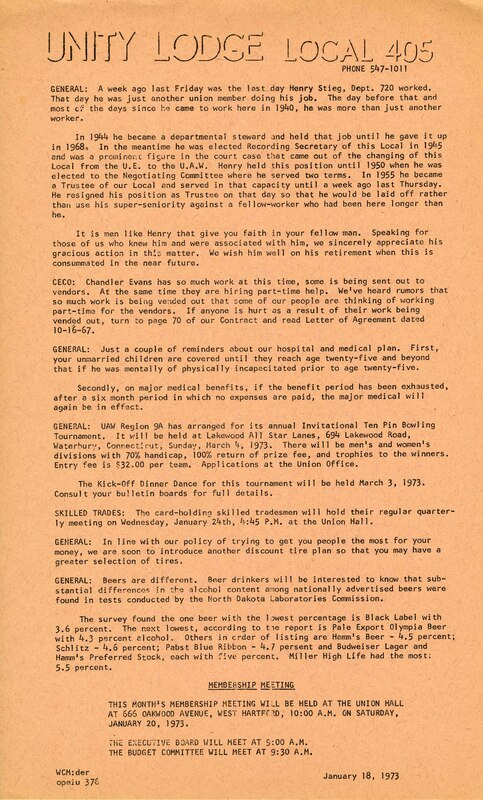 The collections noted here are mostly those consisting of the company records, but many of the records also include the personal papers of the founders and their families. It is these documents that provide a fascinating look into the motivations and mindsets of the people (usually men) who formed and headed some of the state’s most powerful companies. 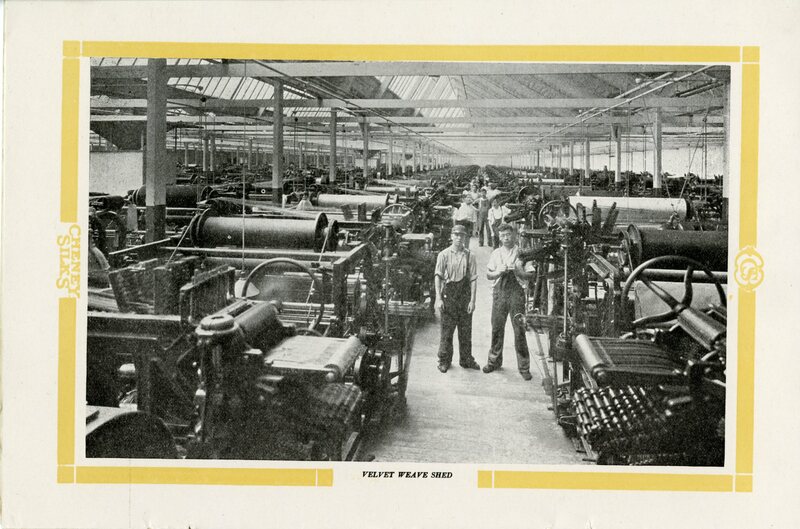 The Somersville Manufacturing Company, formed in 1890 by Rockwell Keeney in the Somersville section of Somers, Connecticut, was a manufacturer of fine woolens. 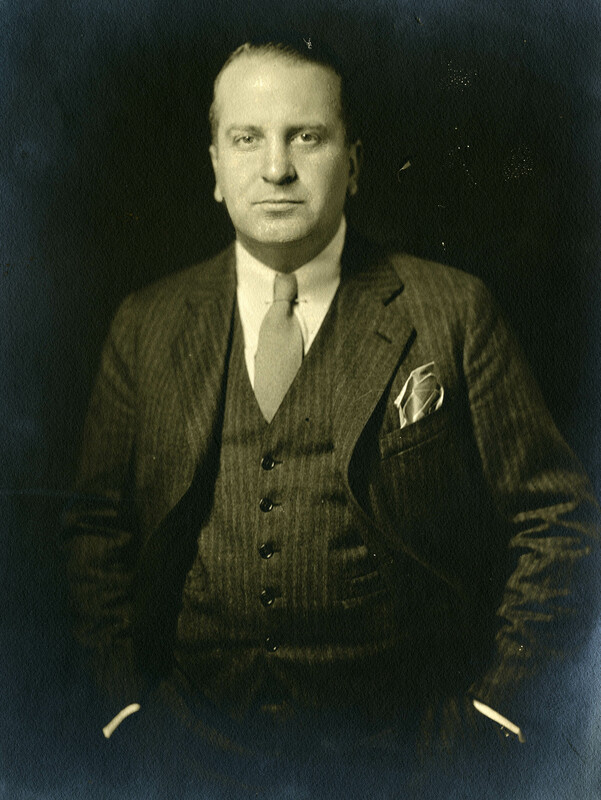 Every successive president and administrator of the company, until it closed in 1969, was either a son or grandson of Rockwell Keeney. 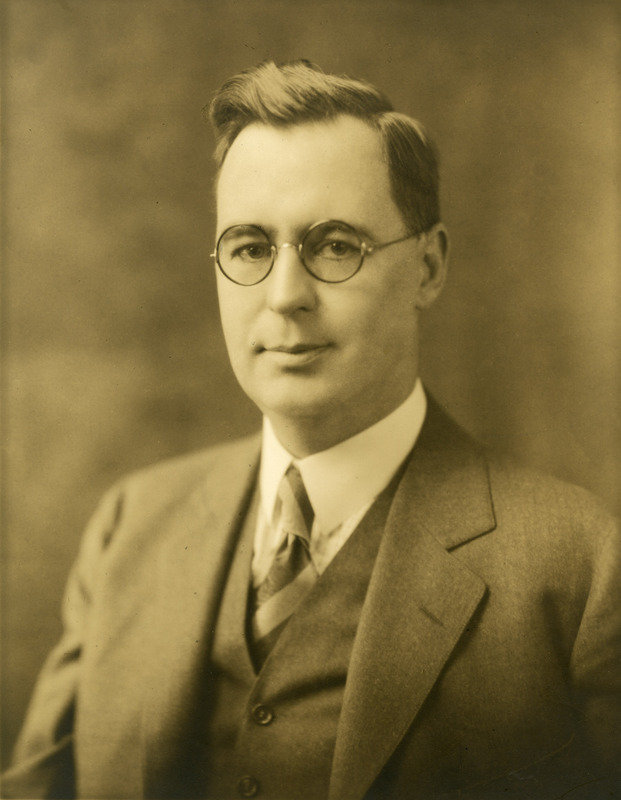 The records hold a great amount of information created by the Keeney family, particularly Robert Leland Keeney, Sr., who served as Vice-President and Treasurer of the company from 1926 to 1960. 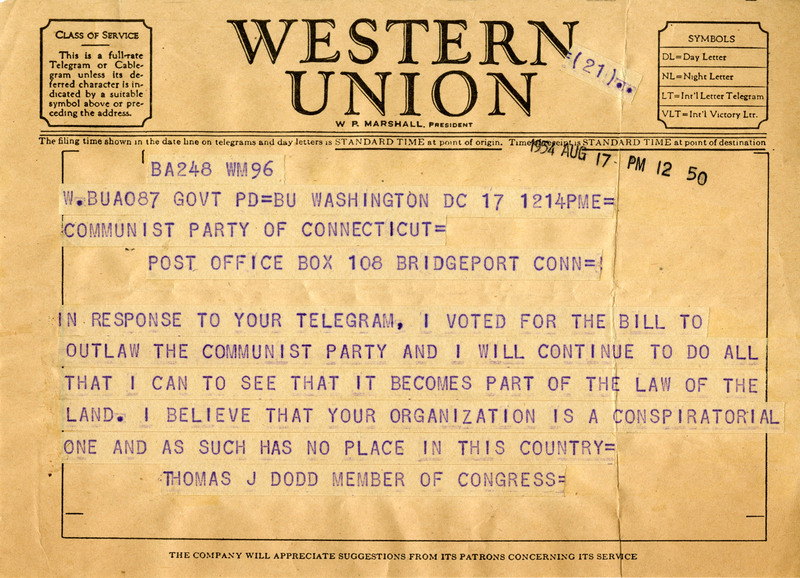 You can find his extensive correspondence from the 1930s and 1940s online in our digital repository beginning here: https://archives.lib.uconn.edu/islandora/object/20002%3A20130030 and the finding aid to the collection at https://archives.lib.uconn.edu/islandora/object/20002%3A860127019. The E. Ingraham Company, maker of clocks and watches, was founded in 1831 by Elias Ingraham, a cabinetmaker and designer of clock cases in Bristol, Connecticut. Elias partnered with others for the next 20 years but by 1855 he was president of the company, serving until his death in 1885. 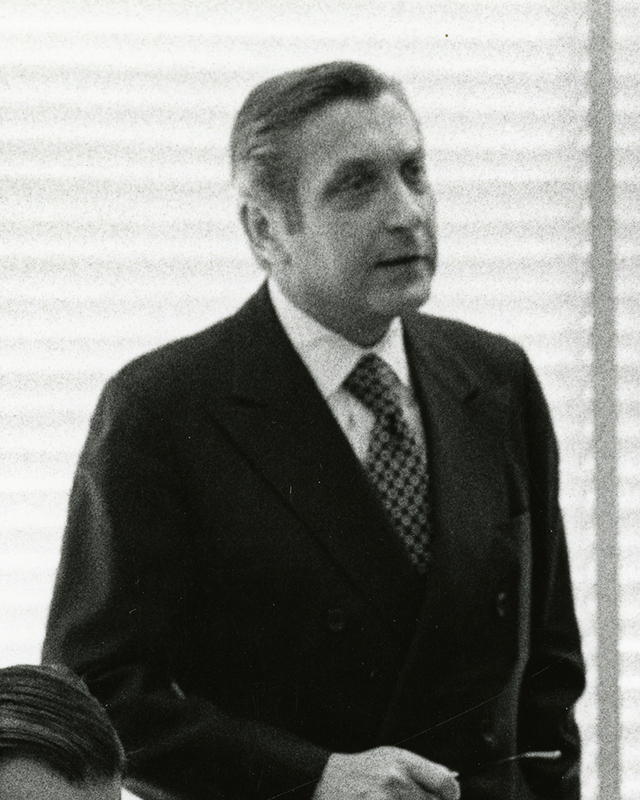 Descendants of Elias continued to run the company or served on its board of directors into the 1960s. 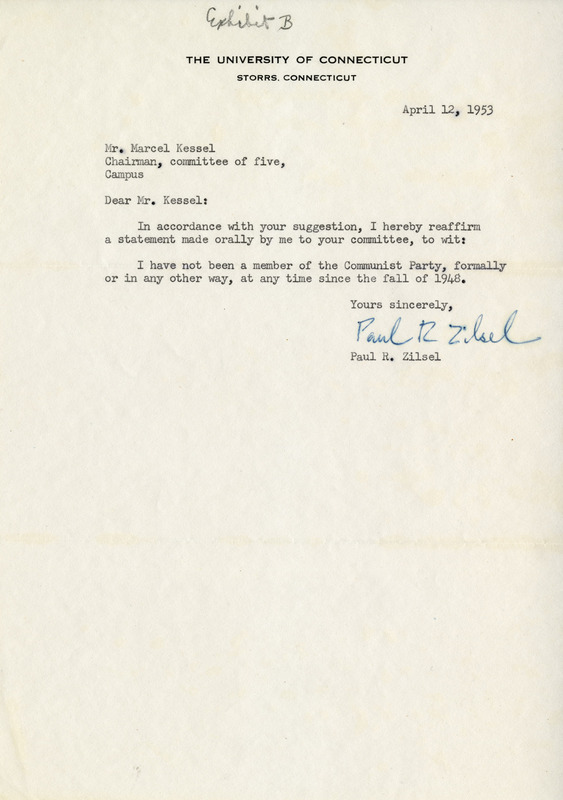 Archives & Special Collections holds the personal papers of Elias’s great grandsons Dudley Ingraham (see the finding aid at https://archives.lib.uconn.edu/islandora/object/20002%3A860140173) and Edward Ingraham II (see the finding aid at https://archives.lib.uconn.edu/islandora/object/20002%3A860140224). The Dexter Corporation originated in 1767 as a family-owned saw, grist and paper mill in Windsor Locks, Connecticut, by Seth Dexter. In its 233 years of operation, the company grew from manufacturing tissues, toilet paper, and tea bags to marketing more specialized products like medical garments and industrial finishes. The company records have documents related to Seth’s descendants in the Dexter and Coffin families; see the finding aid at https://archives.lib.uconn.edu/islandora/object/20002%3A860127029. 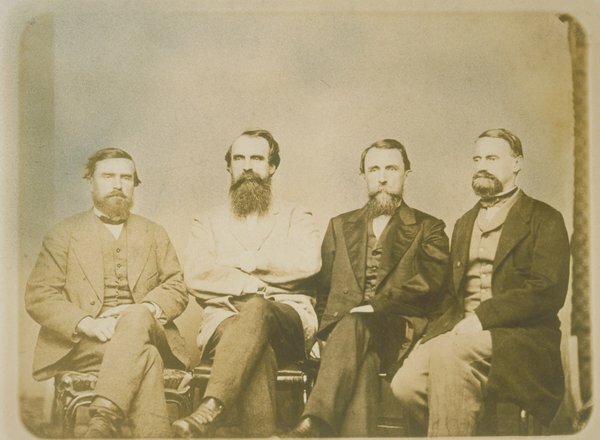 In 1838, six brothers of the Cheney family of Manchester, Connecticut, established the Mount Nebo Silk Company. 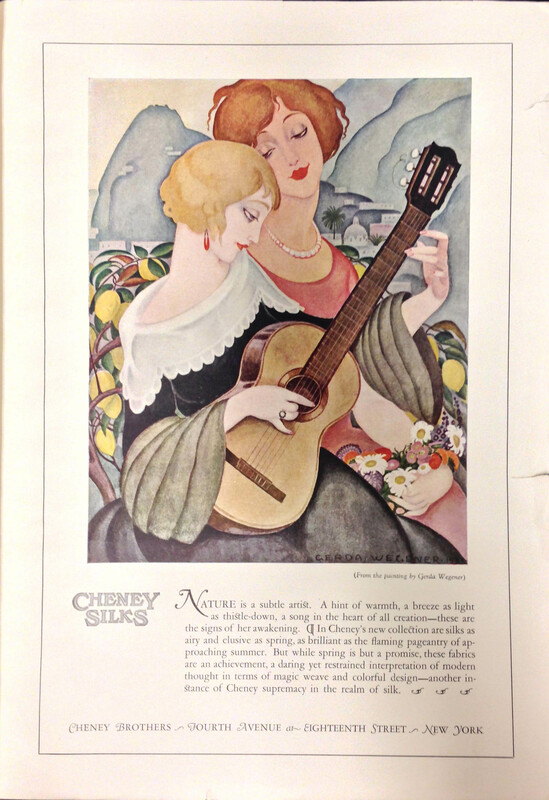 In 1843 the company was renamed as the Cheney Brothers Silk Manufacturing Company and by the late 1800s the company was one of the largest and most profitable silk mills in the country. Cheney Brothers was an integral part of the Manchester community, and known nationally for its benevolent system of welfare capitalism. Members of the Cheney family ran the company until 1955. 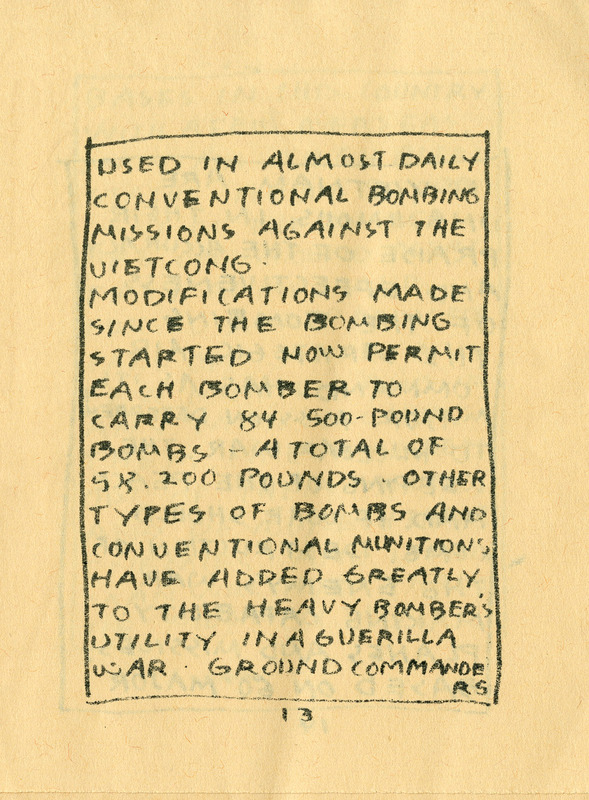 The finding aid to the records can be found here: https://archives.lib.uconn.edu/islandora/object/20002%3A860133921. Founded in 1848 by Almon Farrel, the Farrel Company of Ansonia and Waterbury, Connecticut, was a foundry for copper, iron products and machinery. Descendants of Almon served as presidents until 1981. For more information see the finding aid at https://archives.lib.uconn.edu/islandora/object/20002%3A860133177. The story of the Branford, Connecticut, metal foundry, Malleable Iron Fittings Company, is slightly different than the other companies discussed here. 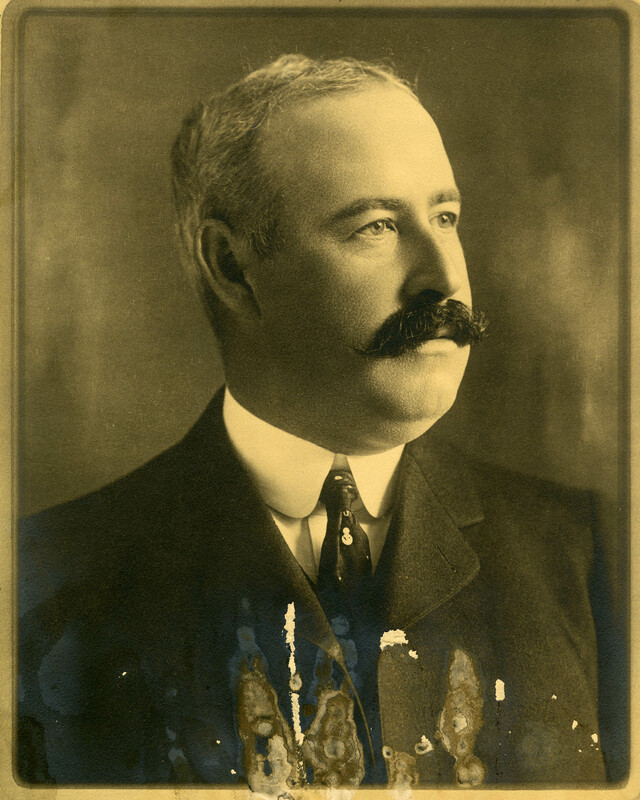 It was originally founded in 1841 by Joseph Nason, who left the company later to be run by Elizur Rogers. Two Danish immigrants, Emil and Thorvold Hammer, joined the company and were soon in charge of its day-to-day management. It was the descendants of the Hammer brothers who became company presidents and guided it to its technological contributions to the iron industry. While you can find the finding aid to the company records at https://archives.lib.uconn.edu/islandora/object/20002%3A860134073, Archives & Special Collections also holds the personal papers of Thorvald Hammer II, grandson of the original Thorvald. 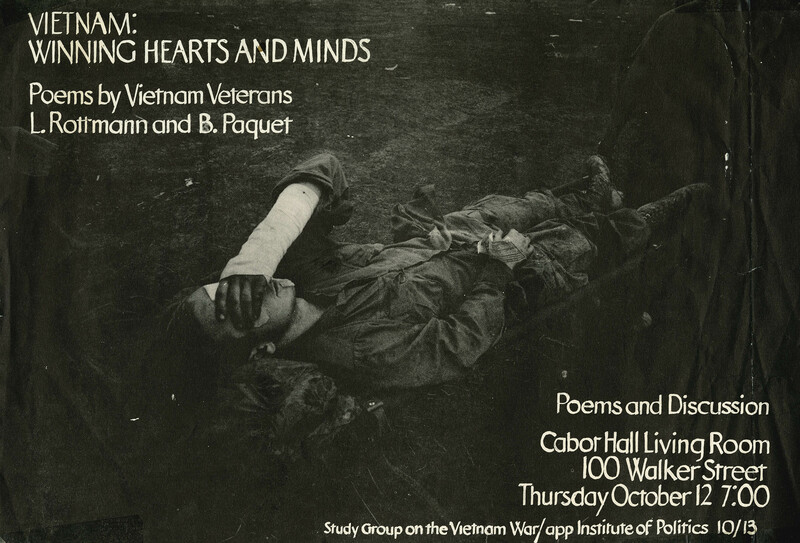 The finding aid is available at https://archives.lib.uconn.edu/islandora/object/20002%3A860139935. 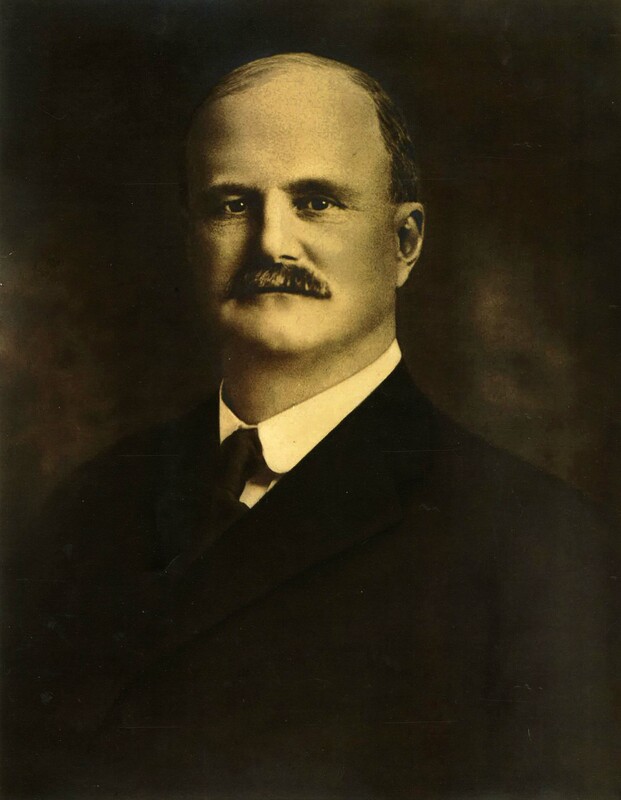 Sargent and Company, a manufacturer of locks and hardware with headquarters in New Haven, Connecticut, was formed by Joseph B. Sargent in 1822. 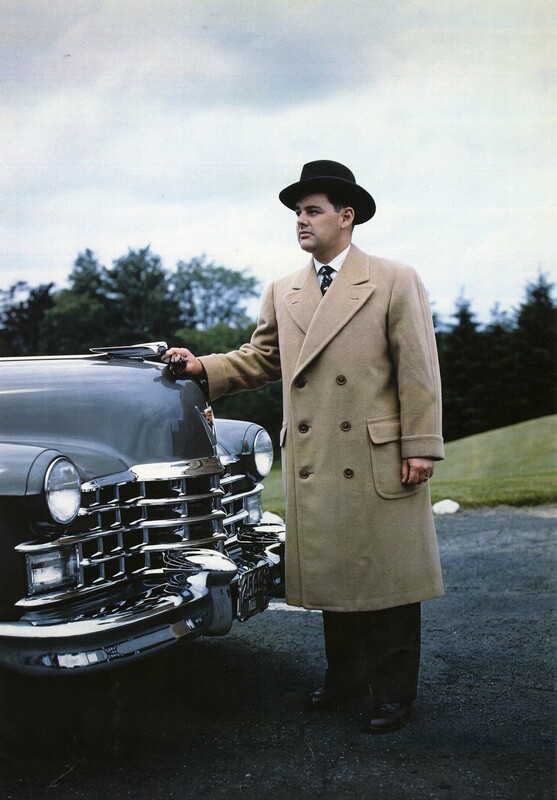 Through the years, until 1928, the company was run by Joseph or his brothers Edward, George and Harrison. 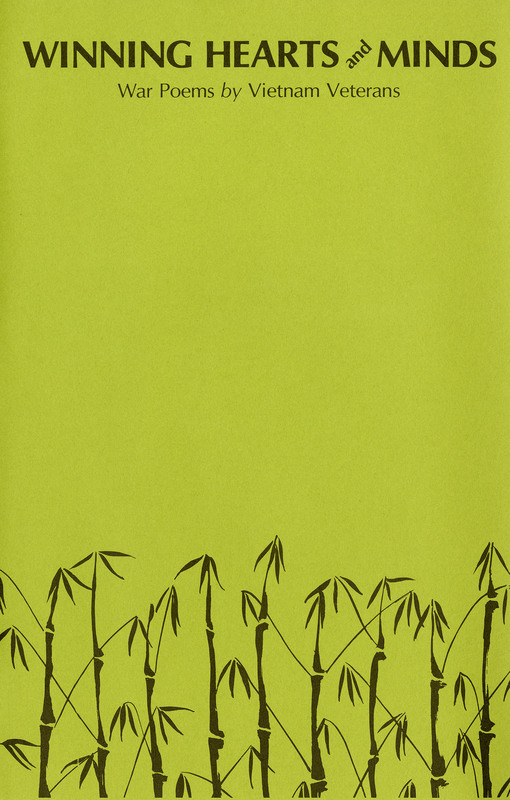 The finding aid is available at https://archives.lib.uconn.edu/islandora/object/20002%3A860134544. 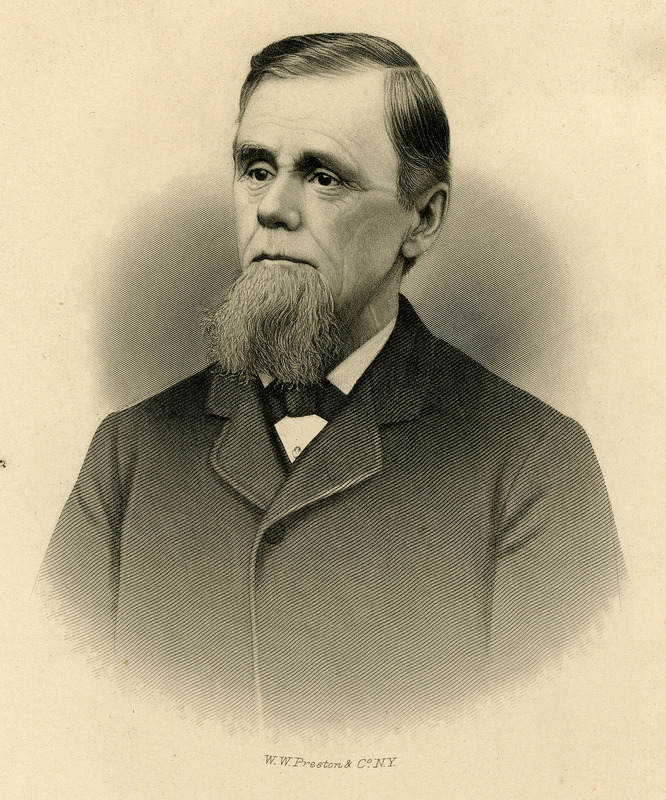 In 1870 Rev. 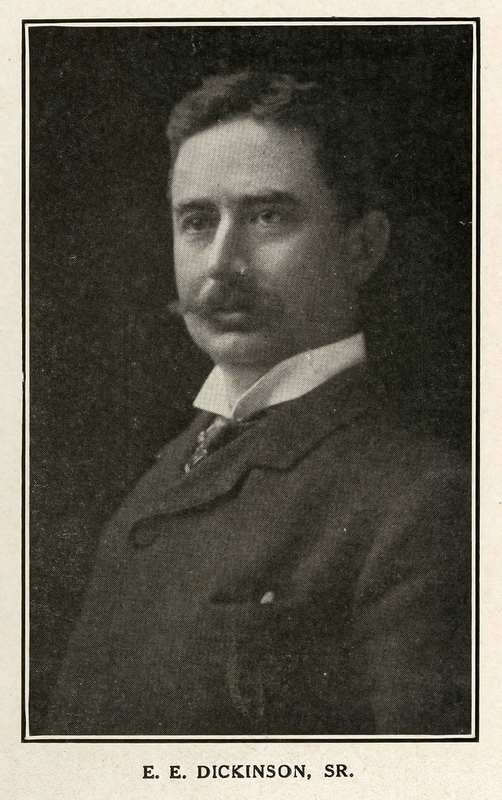 Thomas N. Dickinson took control of a company in Essex, Connecticut, that produced witch hazel extract. He soon sold his interest in the company to his son, Edward E. Dickinson, who then named it E. E. Dickinson & Co. Edward’s son and grandson, Edward Jr. and Edward III, continued to run the company until 1983. 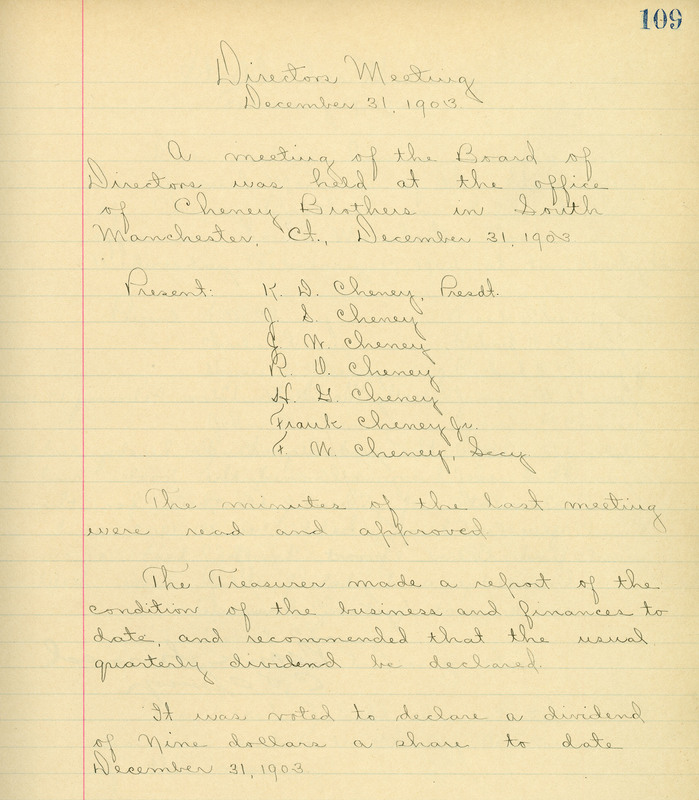 The finding aid to the company records can be found at https://archives.lib.uconn.edu/islandora/object/20002%3A860138808. We invite you to view any of these collections in the reading room in Archives & Special Collections at the Thomas J. Dodd Research Center. Our staff is happy to assist you in accessing these and other collections in the archives. In 1838, six brothers of the Cheney family founded a silk manufacturing company in Manchester, Connecticut. 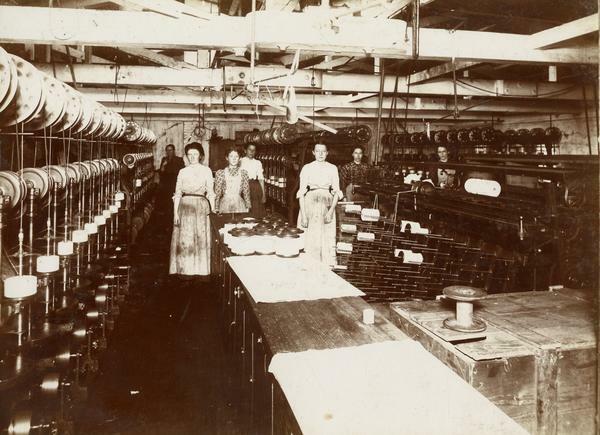 Utilizing innovative silk production methods and new spinning technology, the company became the largest and wealthiest silk mill in the country by the late 1880s. Its success particularly shaped the developing community of Manchester. 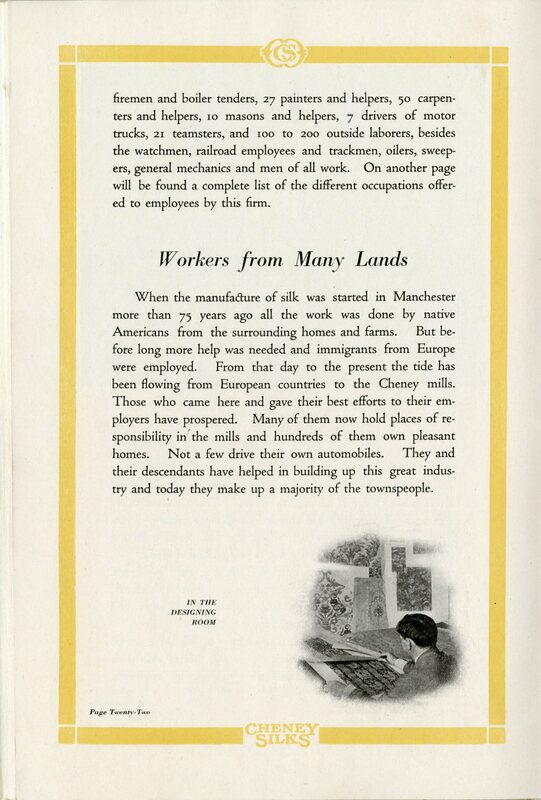 By the early 1920s, Cheney Mills employed twenty-five percent of all Manchester residents, including many immigrant workers. The company’s domain stretched over 175 acres, including mill buildings, houses, schools, churches, recreation centers, and even a railroad. The company became known for its progressive stance toward its employees, and practiced a form of welfare capitalism. However, the prosperity of Cheney Mills was not to last. 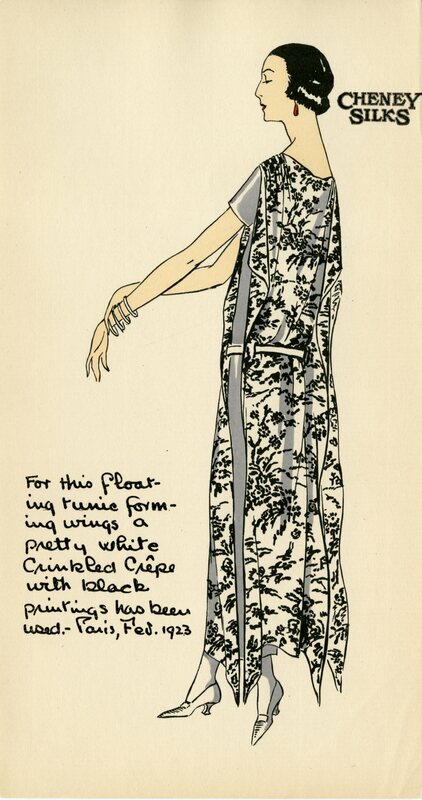 Overproduction in the silk industry and competition from the production of new synthetic fibers led to the company’s decline by the mid-1920s. During the Great Depression, the company had to take out loans to keep the mills in operation. Increased labor conflict in the 1930s eventually forced the company to accept the unionization of its workers under the United Textile Workers in 1934. By 1937, Cheney Mills declared bankruptcy. The company’s prospects improved slightly during World War II when it converted to wartime manufacturing to make silk parachutes for the military. However, the company could not keep up with the high labor costs and competition in the post-war years, and the Cheney family was forced to sell the company to J.P. Stevens & Company in 1955. The mills closed permanently in 1984. Records concerning the general management of the company over time. These include an assortment of documents detailing the company’s earliest history, as well as Board of Directors’ minutes, by-laws, policy letters, information about pay and protocol, and company correspondence. 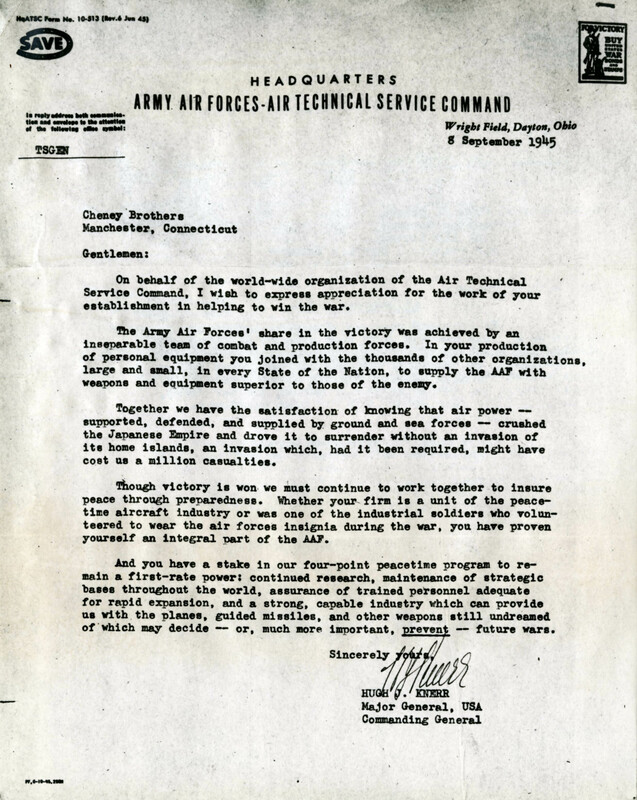 Documents showing Cheney’s marketing strategies. 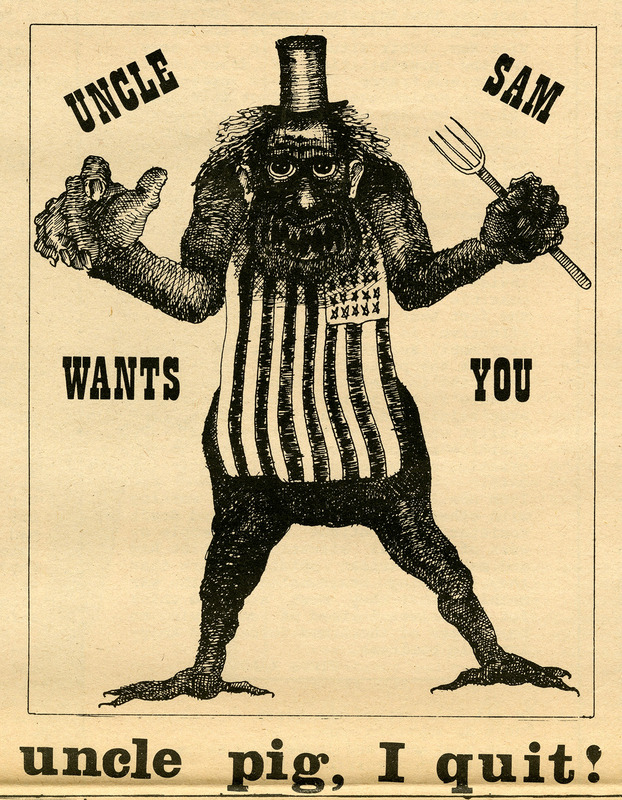 In particular, the collection holds an assortment of Cheney advertisements, particularly from the 1920s. 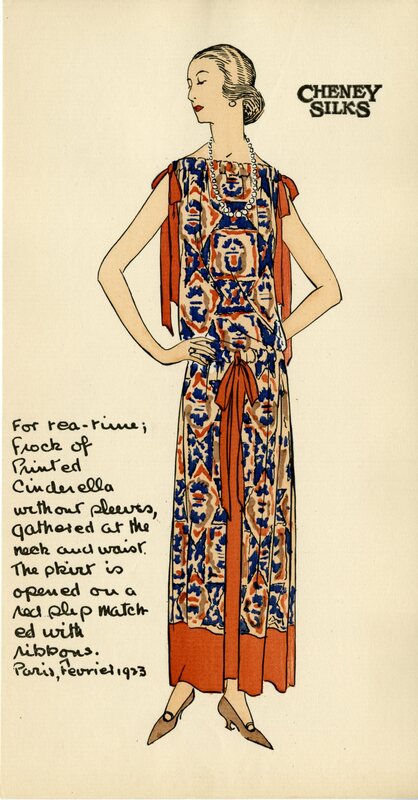 This includes a Cheney publication on the history of fabrics and clothing styles, as well as many advertisements from newspapers and magazines. 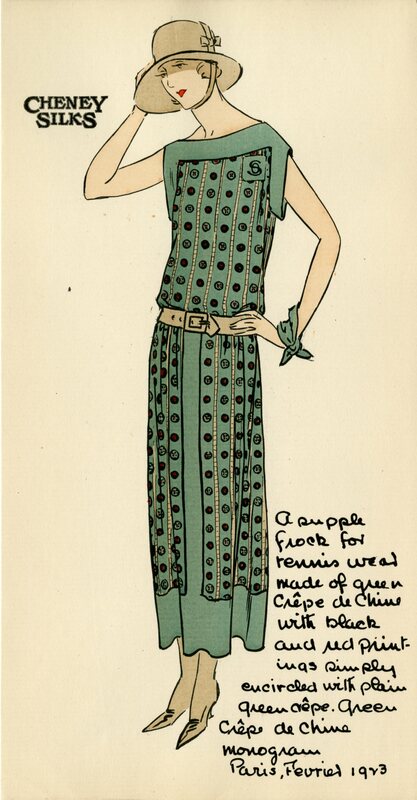 Information related to silk production in the United States in the early twentieth century. 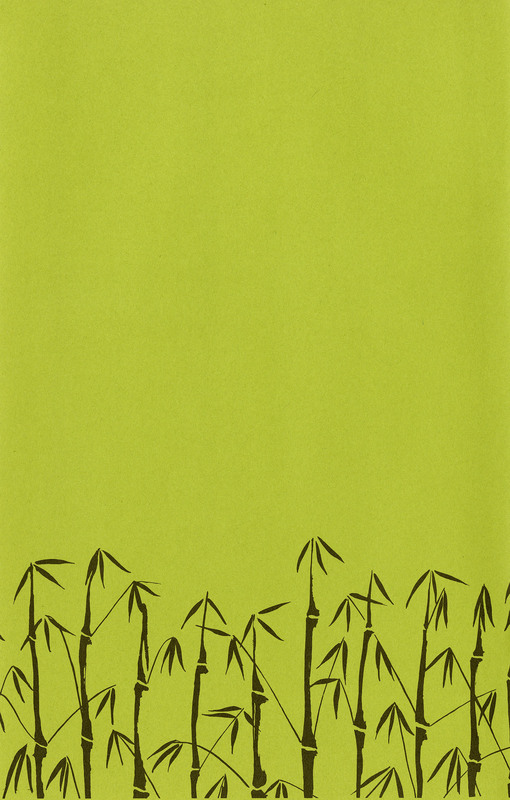 Included in the collection are publications gathered by the company about silk production, Board of Director’s minutes that detail company decisions on directing the course of business, and purchasing ledgers including dealings with suppliers from Japan and China in last half of the nineteenth century. 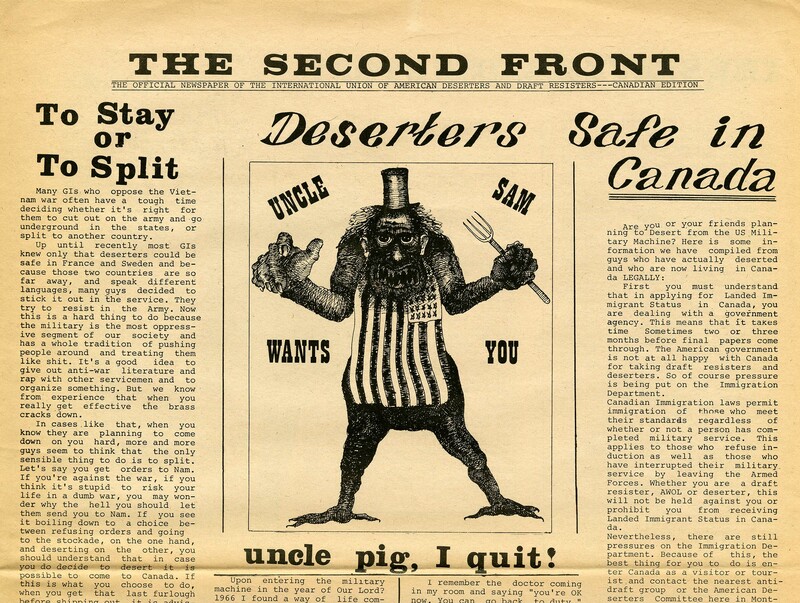 Reports on strikes and the company’s efforts to subvert the unionization of their workers, including records on labor relations stretching from 1930 to 1974. 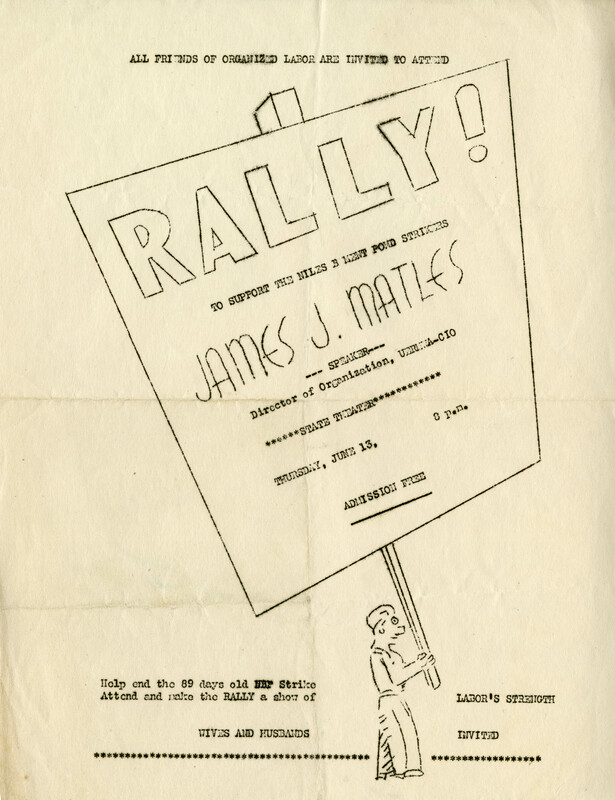 The collection contains reports on strikes, documents from court cases, financial reports, and union contracts. 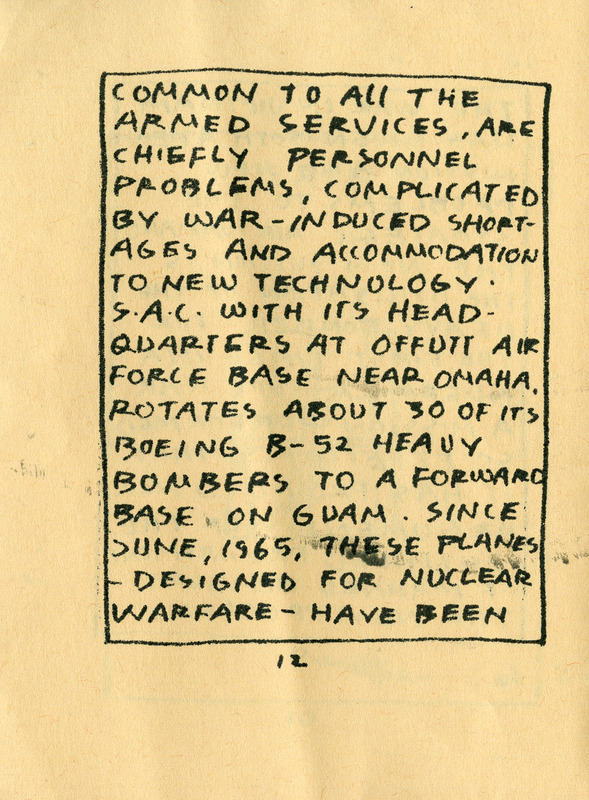 Information about Cheney employees from a collection of personnel files and workers’ cards. 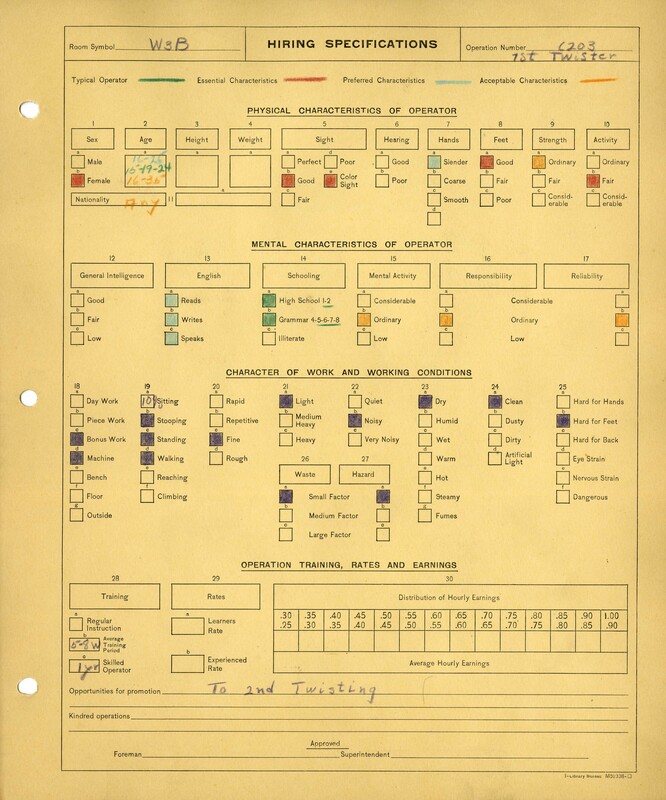 These cards contain not only work-related information, such as position held and department, but also personal information, such as ethnicity, country of origin, family size, and if relatives were in the company’s employ. Available in our digital repository are employee record cards: https://archives.lib.uconn.edu/islandora/object/20002%3AMS19840026. 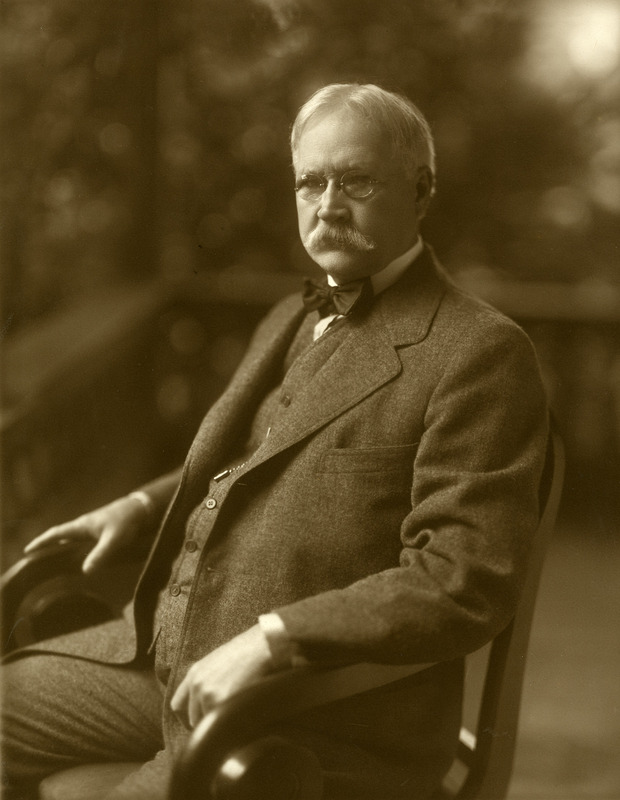 The collection has records as one of the first textile mills to use Frederick Taylor’s methods of scientific management. Taylorism involved applying the scientific method to the management of workers in order to maximize productivity and profit. “Hiring Specifications” scrapbooks from the mid-1920s, which describe each job that workers did for the company from weavers to bobbin boys, and a list required skills and previous training. 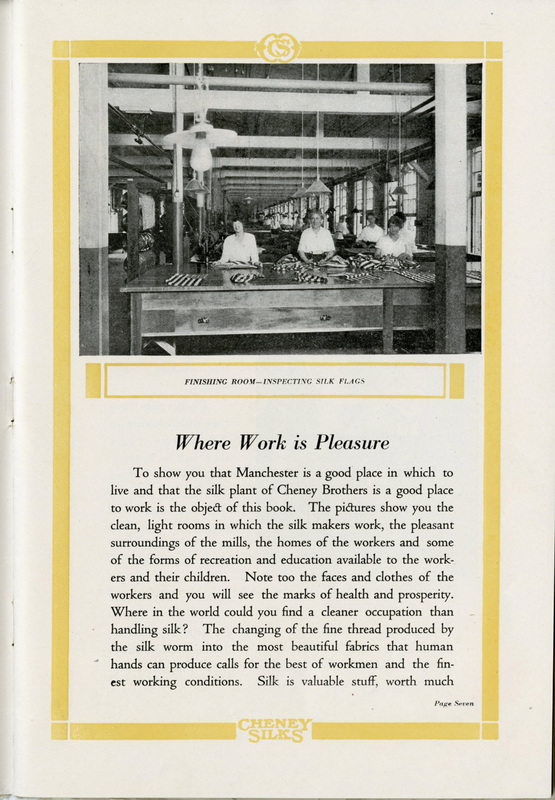 We invite you to view these collections in the reading room in Archives & Special Collections at the Thomas J. Dodd Research Center if you need resources about the Cheney Brothers Silk Manufacturing Company. Our staff is happy to assist you in accessing these and other collections in the archives. 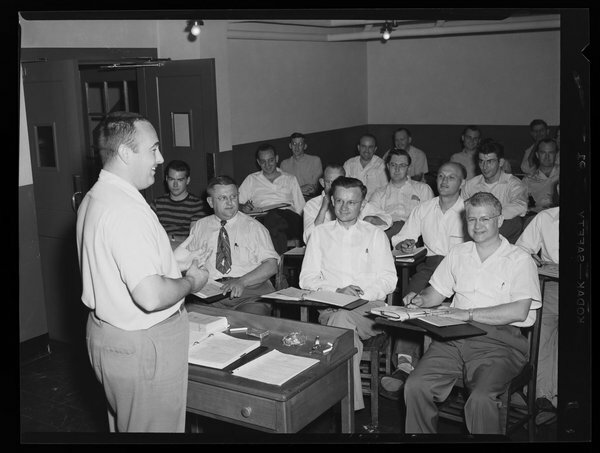 Many imagine the years after World War II as a period of warm relations between labor and management in the United States. Building on the victories of the New Deal and adjusting to the demands of the Cold War, workers and their bosses, so the story goes, reached a steady accord across a range of industries. But labor-management relations in the United States have waxed and waned since the late nineteenth century, and the decades after 1945 were no different. 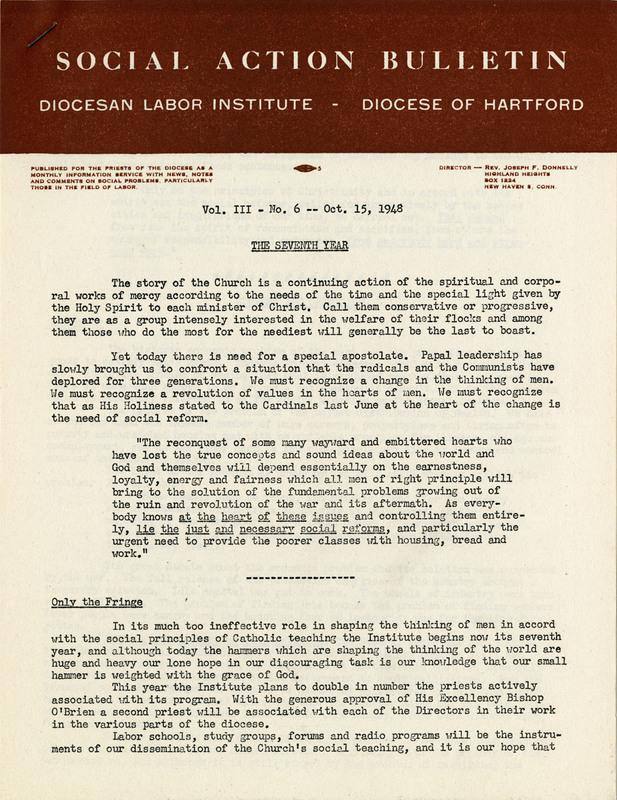 Additional materials on trade unionism in Connecticut held by Archives & Special Collections include the records of many Connecticut labor unions, like the AFSCME, Council 4 Records, the state’s largest AFL-CIO union, as well as many publications on labor and labor issues contain in our extensive Alternative Press Collection. We invite you to view these collections in the reading room at Archives & Special Collections in the Thomas J. Dodd Research Center. Our staff is happy to assist you in accessing these and other collections in the archives. This post was written by Shaine Scarminach, a UConn History Ph.D candidate who is a student assistant in Archives & Special Collections. 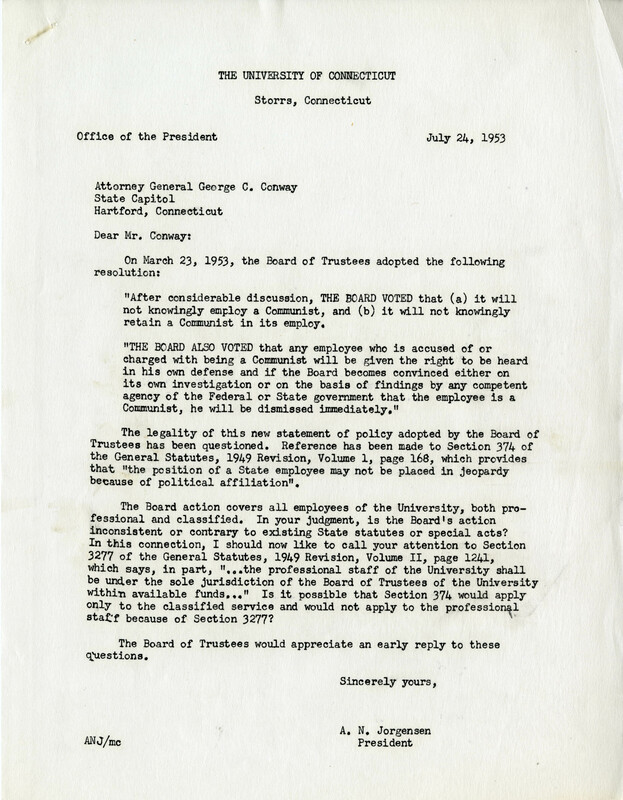 Letter written by UConn President Albert Jorgensen to the Connecticut Attorney General stating that the Board of Trustees voted that any emploee who is accused of or charges with being a Communist will be given the right to be heard in his own defense. After World War II the United States faced a widespread fear of the rise of Communism referred to as the Red Scare, which generally lasted between the late 1940s to the mid-1950s. Led by Senator Joseph McCarthy of Wisconsin, this fear revolved around the apprehension that Communists would infiltrate and subvert society, academia, the workplace and the federal government. 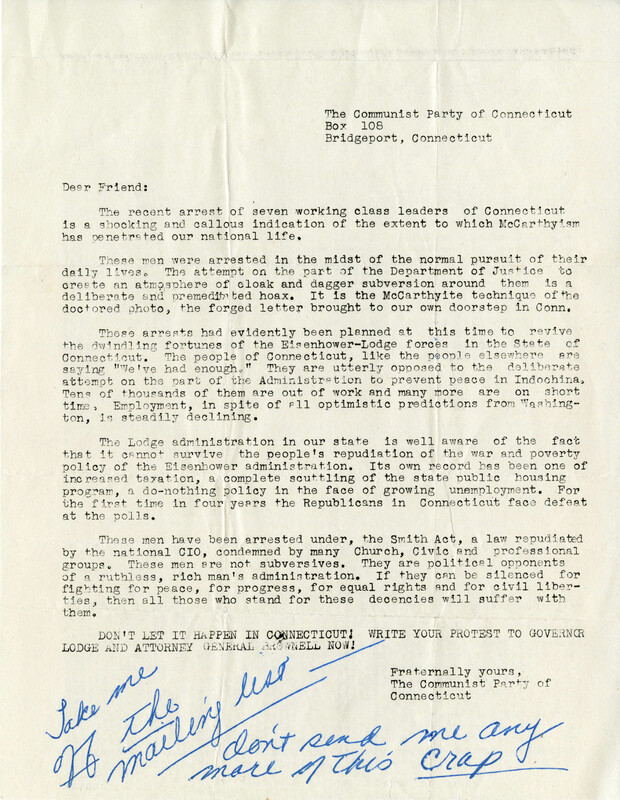 Accusations of subversion and treason were made to thousands of citizens and many lost their jobs or were put on trial for perceived sympathy with Communists or for membership in the Communist Party. Many were prosecuted for violating the Smith Act, whereby penalties were imposed for those who advocated for the overthrow of the government. 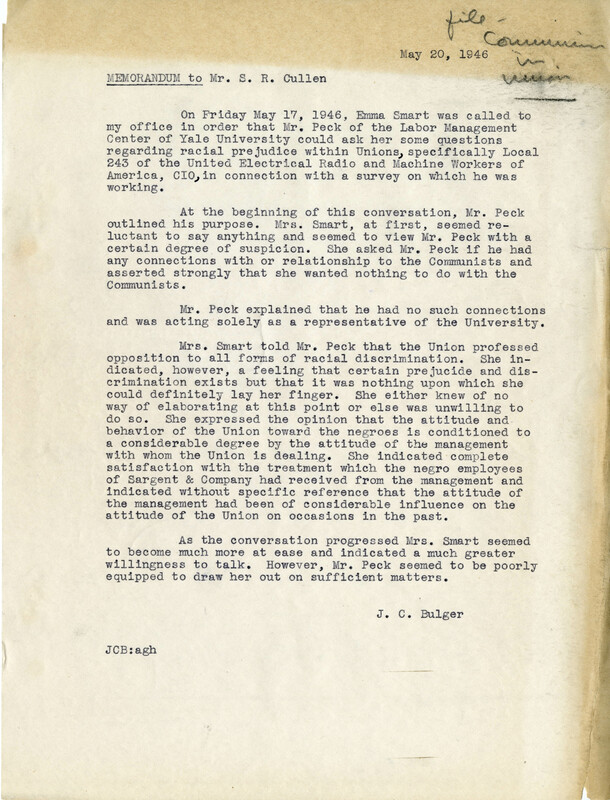 The papers of UConn President Albert Jorgensen also include a small amount of information about the accusations of UConn faculty in the 1950s. 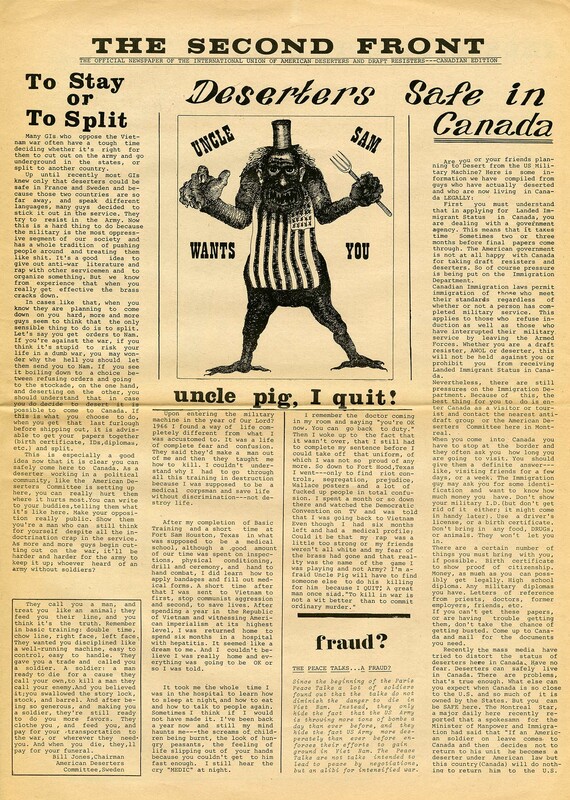 The Labor History Archives has information about Communism scattered across many collections, and the Alternative Press Collection can also provide resources. Please ask at the reference desk for more information. 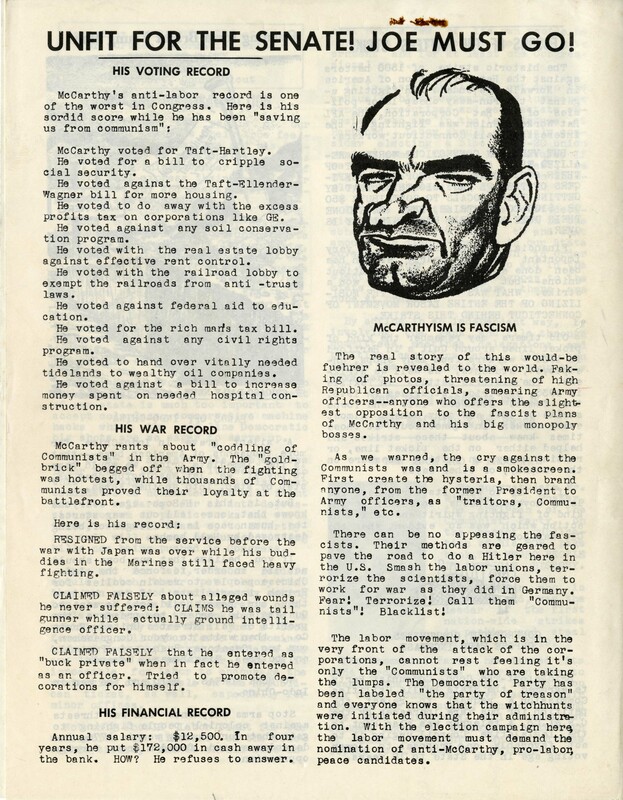 The collections also include many contemporary published sources, mostly pamphlets and flyers, from the Alternative Press Collection, about the Red Scare. 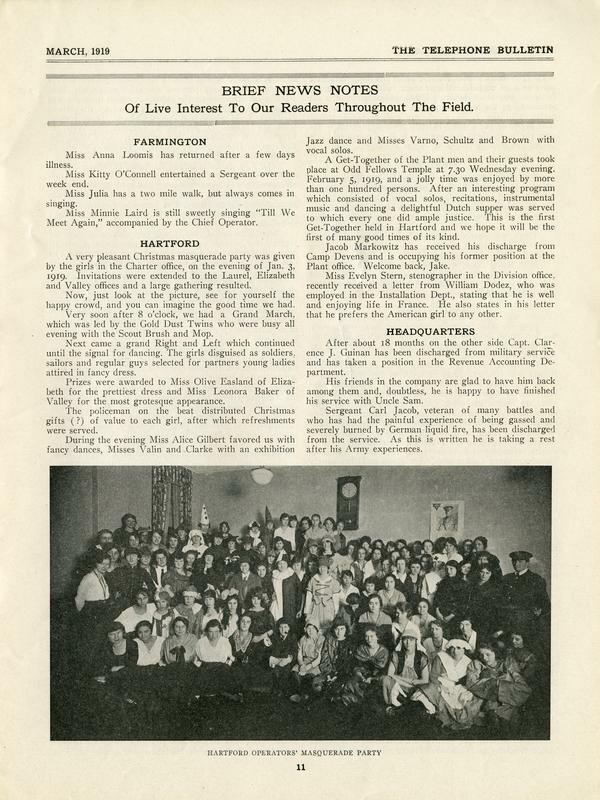 They include the pamphlet “Why Negroes are Joining the Communist Party,” from 1946. 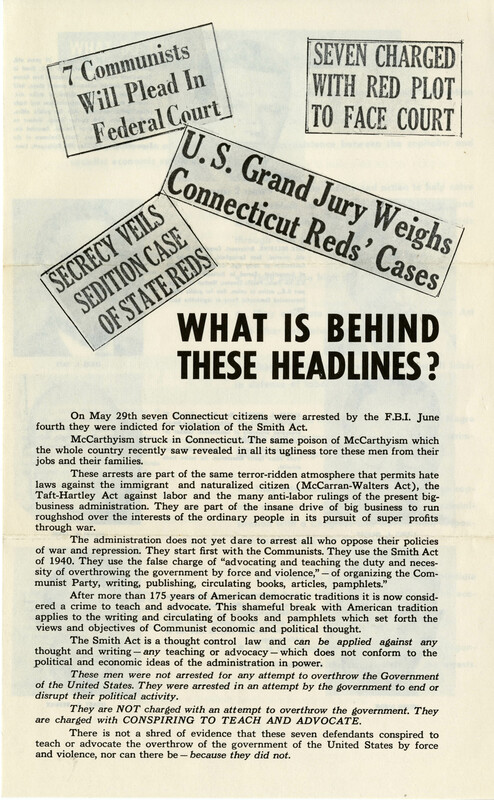 We invite you to view these collections in the reading room in Archives & Special Collections at the Thomas J. Dodd Research Center if you need resources about the Red Scare, McCarthyism, the Smith Act, or the general climate of the United States in the late 1940s or early 1950s. Our staff is happy to assist you in accessing these and other collections in the archives.